Once upon a time, The Fit Londoner went to law school and signed up for a white collar boxing event. During the training sessions, she grappled with jib-jabbing, did burpees followed by skipping rope work followed by burpees again and did lots of pad work. Life took over and sadly The Fit Londoner had to drop out of the boxing event, but despite this, she had left with a new interest in boxing. Even if her coordination was....non-existent. So when she was invited to try out the new boxing studio, Moreno Boxing, in Clapham, she jumped at the chance. Moreno Boxing Clapham is the second studio of the Moreno Boxing family - the first location being in Dalston. Boxing can be intimidating for some people, but the beauty with Moreno Boxing, founded by Carlos Moreno, is that its classes give people that experience of boxing without necessarily having to worry about getting into the ring! I really liked that because some people are put off from boxing because they don't want to get into the ring - so Carlos' studio has helped remove certain barriers. All this talk about the studio, and I haven't even spoken about Carlos' credentials. Carlos has been boxing since he was 18 and has won over 30 amateur titles. He turned down opportunities to go pro and instead focussed on teaching. This speaks volumes and just shows how passionate Carlos is about the sport and spreading the word about it. There are two classes that are taught at Moreno Boxing: TIB (Technical Intensive Boxing) and IBXT (Intensive Boxing Cross Training). I attended the IBXT class and can confirm it was a hell of a workout. The beauty with boxing is that takes in a lot of elements of fitness and exercise: you can be working on your cardio, agility, coordination and strength all in one session. All of which are important features for runners, but something a lot of runners don't necessarily work on. I do love a workout that pushes me, gets my heart rate up and transforms me into a sweaty, hair-all-over-the-place person, and it was safe to say that Moreno Boxing's IBXT's class did just that. Deadlifts, bodyweight exercises, battle ropes and boxing drills were just part of what came in full force during the class; oooh I do love a battle rope workout. The variety in the class was also what I liked; they kept you on your tiptoes (figuratively and literally) the whole time. I know a lot of you are runners, and I really have to emphasise how important cross-training is in your programmes (speak to any trainer and running coach about that). The explosive moves and boxing drills in Moreno Boxing's IBXT class will help you to become faster and the bodyweight exercises work on your whole body and core - a strong core is a runner's friend. Plus, variety in training is key to keeping you focussed on your goals. I don't know about you, but if I solely did running for training for my races, I would go a little insane! It doesn't matter what are your fitness level or boxing experience. The classes are tailored for everyone and the size of the studio means that the classes are small, allowing for a more personalised approach. 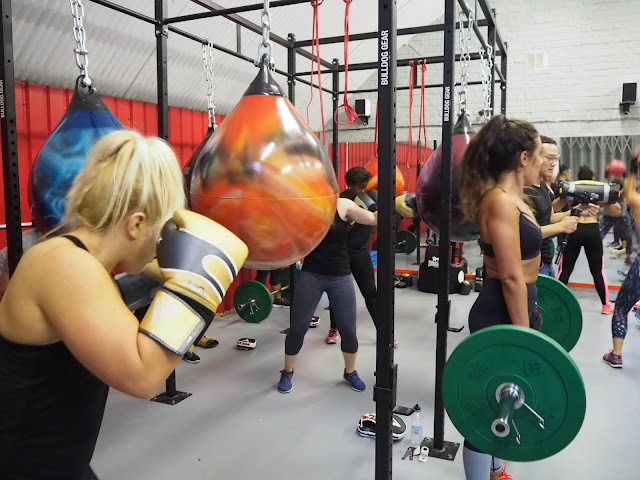 So on the days your training programme states cross-training, instead of hopping onto a cross-trainer, why not go to Moreno Boxing's IBXT class, where you'll also get to learn more about another sport. Can you train for an Ironman with only £1000 to spend on ALL the gear? All content is ©The Fit Londoner unless stated otherwise. Simple theme. Powered by Blogger.